Aramaic is the ancient language of the Semitic family group, which includes the Assyrians, Babylonians, Chaldeans, Arameans, Hebrews, and Arabs. In fact, a large part of the Hebrew and Arabic languages is borrowed from Aramaic, including the Alphabet. The modern Hebrew (square) script is called "Ashuri", "Ashuri" is the Hebrew name for Assyrian, the name being used to signify the ancestor of the Assyrians, Ashur the son of Shem, the son of Noah (Genesis 10:22). Aramaic is quoted in the very first book of the Bible, Berisheth (Genesis) in Chapter 31:47. In fact, many portions of the Old Testament are penned originally in Aramaic, including Daniel chapter 2:4 thru chapter 7. Approximate Date: 9th-8th century B.C. Place of Discovery: Tel Dan, Galilee, Israel. The first known inscriptions of Aramaic date to the late tenth or early ninth century B.C. In a phenomenal wave of expansion, Aramaic spread over Palestine and Syria and large tracts of Asia and Egypt, replacing many languages, including Akkadian and Hebrew. For about one thousand years it served as the official and written language of the Near East, officially beginning with the conquests of the Assyrian Empire, which had adopted Aramaic as its official language, replacing Akkadian. During the later Chaldean (Neo-Babylonian) and Persian conquests, Aramaic had become the international medium of exchange. Despite Hellenistic influences, especially in the cities, that followed the conquests of Alexander the Great of Macedonia, Aramaic remained the vernacular of the conquered peoples in the Holy Land, Syria, Mesopotamia and the adjacent countries. It ceded only to Arabic in the ninth century A.D., two full centuries after the Islamic conquests of Damascus in 633, and Jerusalem in 635. Aramaic has never been totally supplanted by Arabic. Aramaic had been adopted by the deported Israelites of Transjordan, exiled from Bashan and Gilead in 732 B.C. 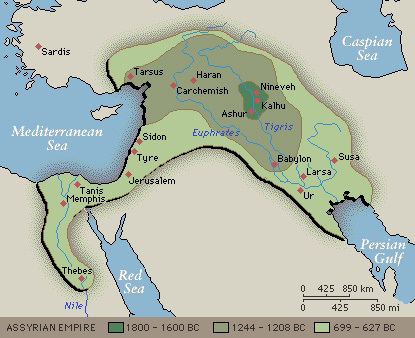 by Tiglath-Pileser III, the tribes of the Northern Kingdom by Sargon II who took Samaria in 721, and the two tribes of the Southern Kingdom of Judah who were taken into captivity to Babylon by Nebuchadnezzar in 587. Hence, the Jews who returned from the Babylonian Captivity brought Aramaic back with them to the Holy Land, and this continued to be their native tongue throughout the lifetime of Eshoo Mshikha. I, Abba, son of the priest Eleaz(ar), son of Aaron the high (priest), I, Abba, the oppressed and the persecuted (? ), who was born in Jerusalem, and went into exile into Babylonia and brought (back to Jerusalem) Mattathi(ah), son of Jud(ah), and buried him in a cave which I bought by deed. During the Hellenistic period of the Seleucids, Aramaic ceased to be a uniform language, when various dialects began to form, due to regional influences of pronunciation and vocabulary. Some of these dialects became literary languages after the differences had increased. The language, henceforth, divided into an Eastern branch, with a number of dialects, and a Western branch with its dialects, but all of which retained a great similarity. Aramaic Coins from Judea; A.D. 132-135 A.D. From the period of the 2nd Revolt. OBVERSE: Five stringed lyre surrounded by Aramaic inscription: SHNT AHT LGALT YSRAL (year one to the freedom of Israel). 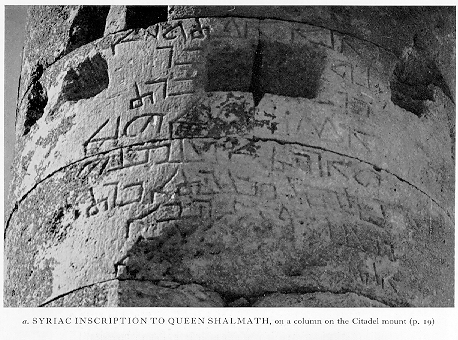 REVERSE: Palm branch within wreath surrounded by Aramaic inscription: SHMOWN NSYA YSRAL (Shimon the prince of Israel), all within dotted circle. 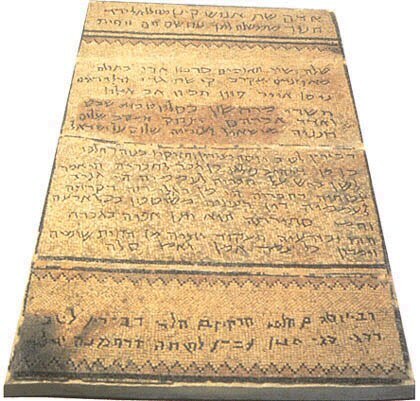 An Aramaic letter from Simon bar Kochba to Yehonathan bar Be'aya, written during the Jewish revolt 132-135 CE. Middle Aramaic, 200 B.C. 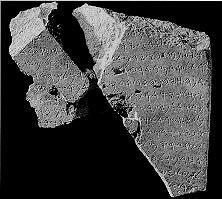 - 200 A.D.
Aramaic Inscription in the Prayer Hall of the Ein Gedi Synagogue, Dead Sea, Israel. 3rd-century A.D. The Aramaic in which the Bible called "Assakhta Peshitta" is written, known as the Peshitta Text, is in the dialect of northwest Mesopotamia as it evolved and was highly perfected in Orhai, once a city-kingdom, later called Edessa by the Greeks, and now called Urfa in Turkey. Harran, the city of Abraham's brother Nahor, lies 38 kilometers southeast of Orhai. The large colony of Orhai Jews, and the Jewish colonies in Assyria in the kingdom of Adiabene whose royal house had converted to Judaism, possessed most of the Bible in this dialect, the Peshitta Tenakh. Edessa Citadel Mount with an Aramaic inscription in Estrangela script. Edessan coin depicting King Abgar Ukkama, the world's first Christian King. This Peshitta version of the Old Testament was taken over by all the Churches in the East, which used, and still use Aramaic, as far as India, and formerly in Turkestan and China. The Peshitta Tenakh was completed during Apostolic times with the writings of the New Testament. Hsian-Fu (Xian) Monument commemorating the arrival of Christianity in China in 635-781 A.D. Medium: black, sub-granular limestone. Approximate Date: 781 A.D. Place of Discovery: Hsian-Fu, Shanhsi Province, China. Current Location: Pei-lin, China. This literary form of Eastern Aramaic was pronounced differently in the Western countries under Roman rule and its Byzantine successor, and became the "Western" dialect, influenced by Greek grammar and style. In the Parthian (Persian) Empire, the language retained its archaic style, syntax and pronunciation. 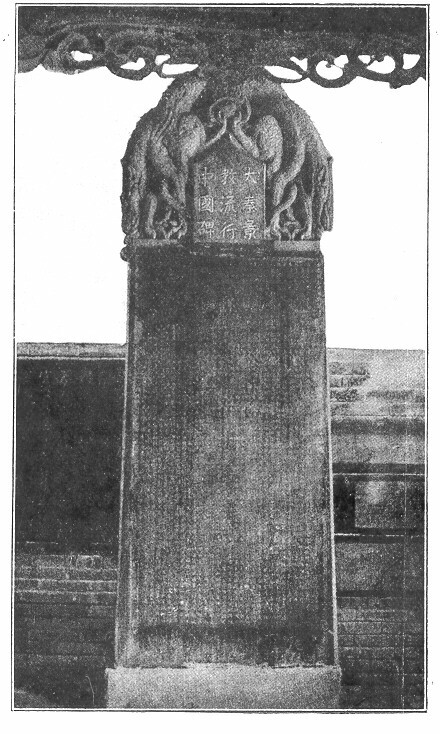 Besides celebrating the arrival of Christianity in China in 635 A.D., the inscriptions consist of one thousand nine hundred Chinese characters and about fifty Aramaic words (in the Estrangela script), containing some seventy names of Assyrian missionaries in rows on the narrow sides of the stone with the corresponding Chinese characters denoting the Chinese synonyms or phonetics for the Assyrian names. Greeks had called Aramaic by a word they coined, 'Syriac', and this artificial term was used in the West, but not in the East, where it has always been known by its own name, 'Lishana Aramaya' (the Aramaic language). Modern Eastern Aramaic has sixteen dialects, spoken by Christians and Jews, and a widely spoken western dialect. Modern Western Aramaic is spoken in three small villages north of Damascus, but in a very mixed form with words borrowed from Arabic and Turkish. Christian manuscripts in Eastern Aramaic are written in the ancient script called Estrangela (round, thick set) with no vowel markings. After the fifth century A.D., two different scripts developed. In the West, a script (of which half the letters no longer resemble the Estrangela), called 'Serto' (strophe) is used, with five capital Greek letters for vowels, written on their side, above or below the letters. In the Eastern script, called 'Madinkhaya' (Eastern) or 'Swadaya' (Contemporary), only five of the twenty-two letters have been slightly modified. To indicate the seven vowels there are various accents, with two different strokes to indicate the semi-vowels, resembling the Jewish systems of Tiberias or of Babylon. A graphical representation of the different scripts used by the Assyrians. The first line is the Eastern Estrangela script, the second is the Western Estrangela script. The third line is the modern Eastern script (Swadaya) and the last line is the modern Western script (Serto). Modern Aramaic, in its various dialects, is spoken in modern-day Iraq, Iran, Syria, Israel, Lebanon, and the various Western countries to which the native speakers have emigrated, including Russia, Europe, Australia and the United States. This exquisite mosaic was discovered at the ancient synagogue of Hamat Gader and was restored by the Israel Antiquities Authority. 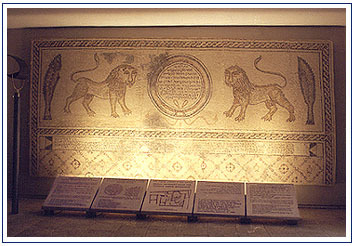 Aramaic inscriptions on the mosaic testify to the importance of Hamat Gader, a city renowned for its baths during the Roman period. The inscriptions express gratitude for the financial contributions raised throughout the country to build the synagogue. 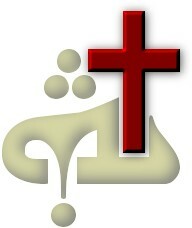 Churches which still use Aramaic as their liturgical language include the Church of the East, the Chaldean Catholic Church, the Syriac Orthodox Church, the Syriac Catholic Church, and the Maronite Catholic Church.